A short trail with some rough spots and some smooth spots. Starting from the trailhead on the right (see pictures below) you hit pretty rocky and steep terrain rather quickly. But once you make it up to the saddle, you get a nice overlook of the trails below and the city behind. The terrain and elevation get much easier from here as well, until you near the end when there is a lot of loose rock. All in all, it’s a good hike for the family if you can convince the kids to make it up that first ascent. The shortcut trims only about a 1/4 mile off the trail, but keeps you higher in the hills and makes it easier to stay on the trial – basically, just keep turning left. The shortcut trail also makes it more like a circumference trail and that offers its own reward. 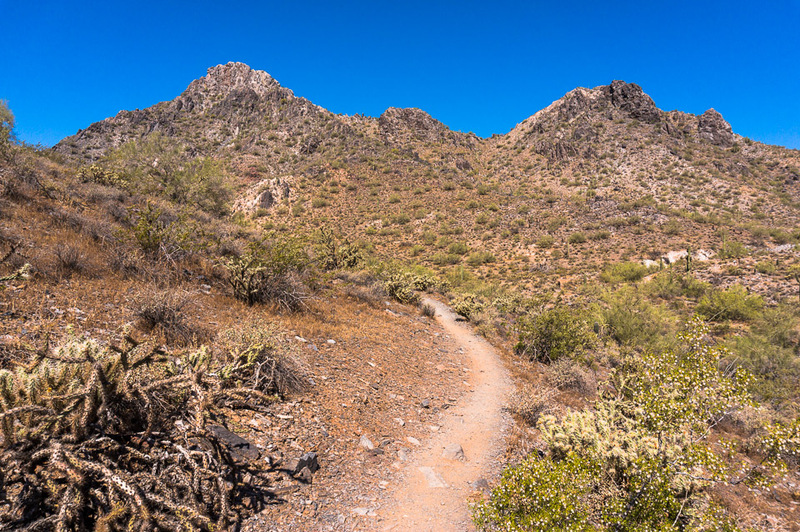 These trailheads at the end of Squaw Peak Drive offer a good place to access the trails deeper in the trail system including 1A, 100, 8, and 8A to name a few. The is a reasonable amount of parking, but there often only seems to be one spot left when I get there. There is a toilet with water fountain a very nice complex of ramadas. And friendly squires who like to get stuck in the trash cans. This entry was posted in Easy, Good Hiking Trails, Hiking Trails, Moderate. Bookmark the permalink.